Hello again, it’s been a while! By no means should you take the recent lack of Gluten Free/San Francisco articles as a sign that there’s not a pretty huge abundance of excellent gluten free options in San Francisco (there are) nor should you take it as a sign that I’m terrible at keeping to an update schedule (I am). After six or so months living in the city by the bay, I’m starting to finally get settled, more or less. As I start to get a routine put together, you can expect more reviews and insight into the gluten free food scene in San Francisco, with any luck, at least once a month. Incidentally, this particular outing doesn’t have a ton to do with food or San Francisco for that matter, as it’s a product you should be able to get in most Whole Foods, Trader Joes, or similar local grocery chains in your area. Before I launch into this in earnest, though, I’ve been asked to include a number of disclaimers. 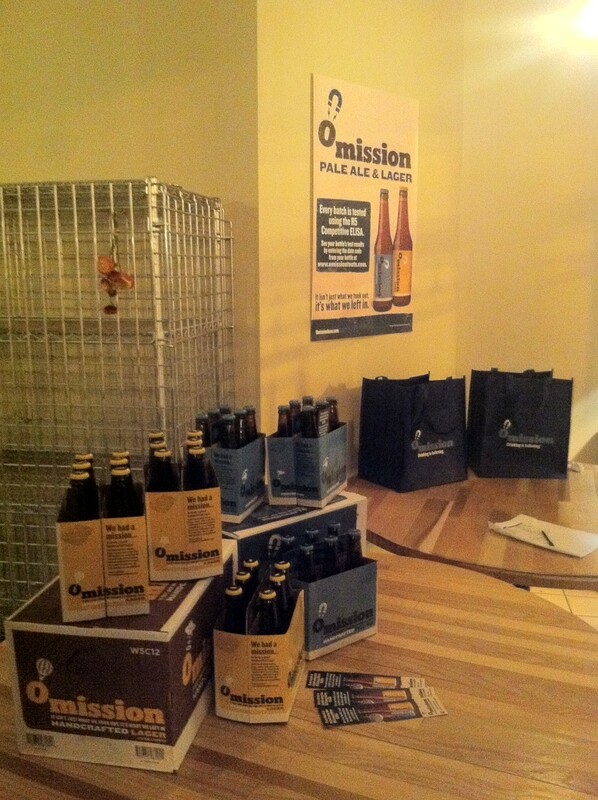 First, I was invited to Omission Beer’s event as a guest, and given free samples of their beer at said event. Second, I was also told I could take as many of the gift bags as I could reasonably carry. Third, I took more of the gift bags than was reasonable to carry. With that out of the way, we’ll join a (very) slightly more inebriated version of me about a week and a half ago, standing on a very full N Judah train just exiting the tunnel that precedes the stop in my neighborhood. It was at this point that I began to realize that three gift bags may have been more than I could reasonably carry. This realization was spurred by an increasing concern that I was going to re-dislocate my shoulder* and doing a bit of mental math as to the weight of 36 bottles of beer. For those interested, it’s about 49 pounds, I weighed it when I got home. You might be asking yourself, “Why did Andy carry 49 pounds of beer home via public transit?” There are about three answers to this, two of them are very good. The first answer, San Francisco is a very expensive place to live, and, despite very much wanting to, driving from Herndon, VA to San Francisco, CA would have been a bad idea for more reasons than I can quickly come up with a number for. The second answer, San Francisco is a very expensive place to live. I was carrying 36 bottles of free beer, which in my mind, was an economic decision. The last, and best, answer, this is very, very good beer that happens to be gluten free. For the better part of my college career, I didn’t drink it, or any other sort of alcohol. This abruptly stopped after turning 21 and moving to downtown Harrisonburg, with quite a few good bars. Aided by the availability of a bunch of excellent beer, I was labeled a “beer snob” about a month or two after I started to drink. I make a point of seeking out great beers I’ve read about and trying them out. I’d always rather have a single bottle of a good craft brew than a six-pack of mediocre lager. I’ve noticed that more than most anything else, great hops and the right brewing grain make excellent beer. With this in mind, I think that’s the issue I tend to have when trying to drink a gluten free beer. Pretty nearly every gluten free beer I’ve tried tends to be made with an alternative grain, such as sorghum. This doesn’t necessarily mean that the beer won’t be good, there are some great brews made with sorghum (Dogfish Head’s Tweason’ale comes to mind) but what you wind up with is a beer that doesn’t taste quite like what you’re used to. Enter Omission. Upon arriving at their event and taking my first sip of their pale ale, I knew this was a brewery that knew beer. Omission Pale Ale’s flavor is exactly what I expect in a pale ale, bitter but pleasant, a bit of citrus, and an extremely clean aftertaste. This isn’t a beer that needs to qualify itself as gluten free, this is a beer that stands on its own as a great craft brew. While sipping the pale ale, I had the chance to speak with the CEO of Craft Brew Alliance, Terry Michaelson. Craft Brew Alliance comprises a few other brands, (Widmer Brothers, Kona Brewing, and Redhook) all of which make some absolutely excellent, but non-gluten free beer. Having had a few of their other brands, I’m not at all surprised they could make such excellent gluten free beer. As the gluten free market grows, I’m not terribly surprised to see a craft brew company get into the GF field either. 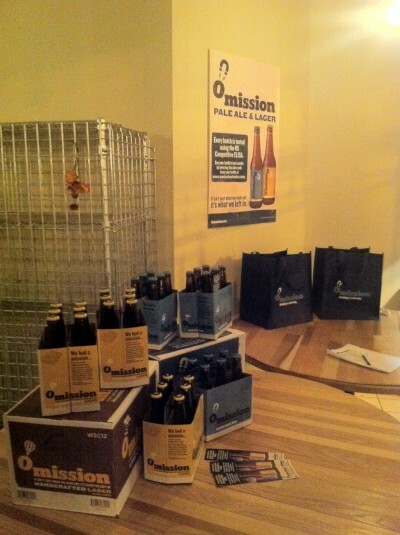 That said, for Craft Brew Alliance, Omission was born at least as much out of personal reasons as it was economic ones. Both CEO Terry Michaelson and Brewmaster Joe Casey’s wife have been diagnosed with Celiac Sprue. 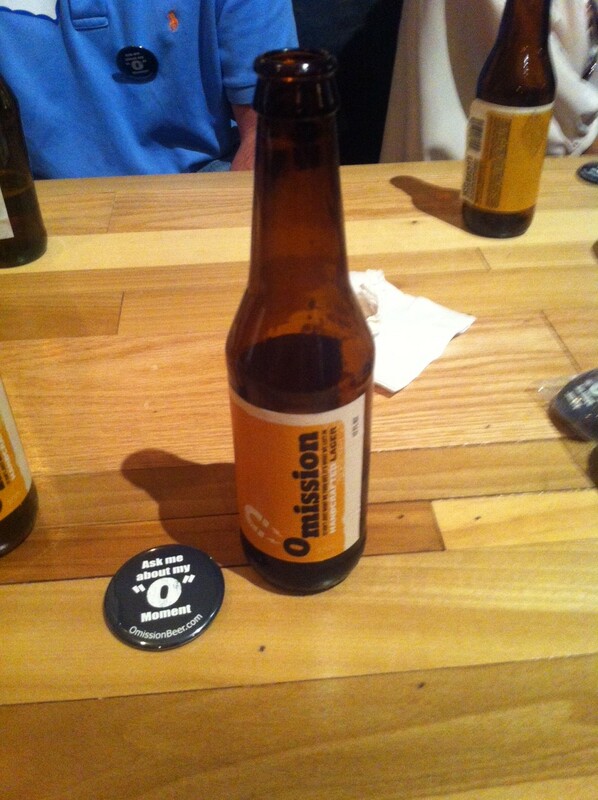 Omission was brewed to bring back the experience of having a beer with friends to the gluten free community. Having shared the pale ale with friends who don’t follow a gluten free diet, I’d say they’ve succeeded. The secret behind this success is the process that goes into making Omission gluten free. As far as the brewing is concerned, Omission is a standard beer up until the end. It’s brewed with malted barley, citra hops, all the things that make a great craft brew. Eventually it’s run through a process to extract the gluten from the beer, and the result is a great beer with less than 5ppm of gluten according to the R5 Competitive ELISA test, one the international standards for gluten free designation. If you’re interested in finding some Omission Beer for yourself, they’ve set up this lovely site here, http://omissionbeer.com/find-omission/ where you can do so. I’d make a very strong recommendation for the pale ale. my best advice would be to check your machismo and just walk away. 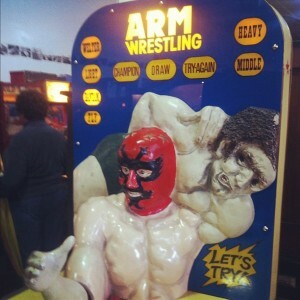 Even if you beat the robot, you’ve got a pretty good chance you’ll dislocate your shoulder in the process. So glad to know that it wasn't Diane sclepping Omission beers on BART. 😉 You can take it, Andy! I'm sure it was well worth the reward of drinking it later. 🙂 Great post and review! Hehe on the arm wrestling "bandit." Hope you're all recovered now! FYI–The beers made with barley where it's removed in processing are still a bit controversial. The ATF won't allow them to say that they are "gluten free," and there are lots of sources that say that standard testing for fermented products is not sufficient. The ATFD issued preliminary guidelines here: http://www.ttb.gov/rulings/2012-2.pdf The Celiac Sprue Association (CSA) site says there is a new, accurate test for fermented products. "Recently the first reliable and accurate test for detecting gluten in fermented or highly refined products became commercially available. The RIDASCREEN® Gliadin competitive is the first generation of tests applicable to fermented products. 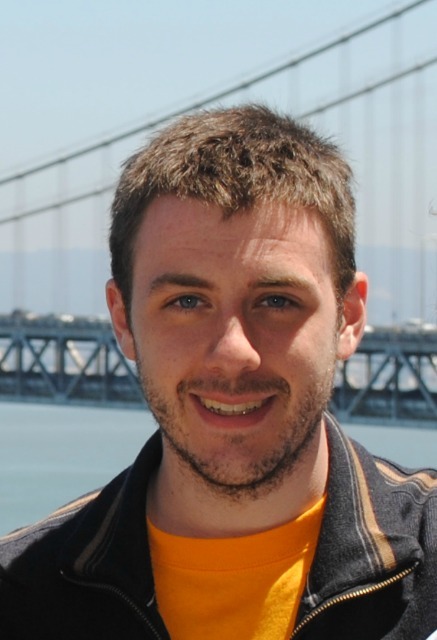 The expensive mass spectrometry process remains the gold standard in protein analysis." http://www.csaceliacs.info/labeling_beer_with_glu… All that said, I took a few sips of an Omission beer and liked it. Thanks for the review! Great blog post Andy. Clever writing – very much enjoyed reading it! As for the beer, though I'm not a huge beer drinker, I will be on the lookout for Omission GF beer and will definitely give it a try. Thank you! Omission gave me a splitting headache for 24 hours. Twice! Anyone want the rest of my six pack?